A long time ago, when I used to live in New York, there was a 2 hour long block of Japanese programming every morning from 7 to 9 on UHF channel 31 (I've forgotten what station that was). The programming originated Fuji Sankei TV. The first hour was taken up by news and such. The second hour was devoted to entertainment programming. 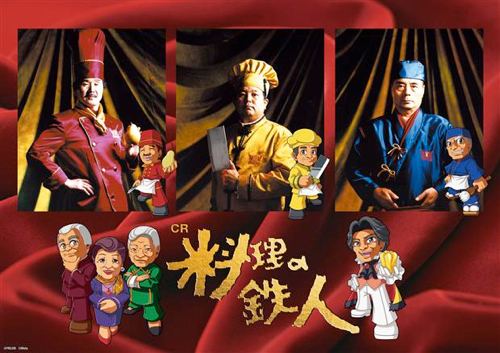 One of the shows they aired was called Ryouri no Tetsujin (料理の鉄人). This was the original Iron Chef. Back in those days I didn't even have a VCR. So on the mornings when Ryouri no Tetsujin aired...let's just say that the subways were allegedly delayed with astonishing regularlity on my way to work. I could not bear to miss a single episode. It became a cult hit in the cities where it aired, even amongst people who didn't understand Japanese at all. Part of its appeal was that so over the top - with its Kitchen Stadium, the excited floor reporter who sounded like one of the sidelines reporters at a sporting event, and of course, Chairman Kaga, who presided over it all with flair and just a bit over-the-top drama, epitomised by the catchphrase he used to declare the start of each match: Allez Cuisine! Despite all those flamboyant and often kitschy surroundings, at its heart the show was a serious homage to great cooking. The Iron Chefs were truly top class chefs in Japan despite being dressed up in gaudy silk clothing. The guest chefs, aka the Challangers, who came to compete against the Iron in their regular chef's whites or other normal chef's clothing, were likewise great chefs. A Challenger who won on Iron Chef could see a serious boost in his restaurant's business, at least for a while. 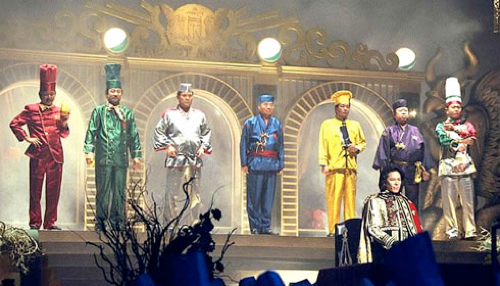 Here's a rare shot of all the chefs who were Iron Chefs on the original, dressed up in their colorful silks, with the Chairman in silver in front. As most of you know, later on the fledgling Food Network obtained the broadcast rights for Iron Chef, had it dubbed (although curiously Chairman Kaga was undubbed and subtitled) and aired it for several years, becoming one of their early hits. (I believe it still continues to air on The Cooking Channel.) After a travesty of an attempt at an American version of the show called Iron Chef USA, which made it into some kind of professional wrestling like horror, a much more restrained version called Iron Chef America was born. This one followed the format of the original quite faithfully, and continues to be one of The Food Network's flagship shows. It has a spinoff, The Next Iron Chef, and several imitators. In a sense, Iron Chef may have ushered in the era of the celebrity chef, for better or worse. Yet - I haven't seen the American version of Iron Chef in years. Somewhere along the way I think they have lost some of the spirit of paying homage to great chefs and great cooking, to revering great ingredients. Instead it pays more attention to the competition side of things: winning or losing is the main event, rather than the food itself. This is even more evident on the spinoff show The Next Iron Chef, which is basically a response I believe to that other highly successful chef competition show, Top Chef. In both shows the chefs are given ridiculous tasks and ridiculous deadlines, set against each other to create friction and drama, and other such things. All of that may make for entertaining television, but it has nothing to do with food. On these shows, food is not the star; it's just a side dish. The original Iron Chef aired in Japan from 1993 to 1999, with a couple of specials airing in 2000 and 2001, for a total of 309 episodes. Surprisingly perhaps, similar shows showcasing 'celebrity chefs' haven't surfaced in Japan. Most of the food oriented shows on Japanese TV these days, aside from venerable cooking shows like Today's Cooking and Kewpie 3 Minute Cooking which have been airing for decades, are about eating out. These shows typically go to picturesque locations in rural areas to find ryokan (inns) or minshuku (B&Bs) that serve delicious local fare, or to 'hidden treasure', not-too-expensive eateries in the cities. Not much attention has been paid on these programs to high-end dining. I've always thought that this could be a reflection on the continuing economic doldrums in Japan for the last decade or so. So, when I heard last summer that Fuji TV was planning to bring back Iron Chef, that original homage to fine dining, I was excited but also filled with more than a little trepidation. Were they going to change the format? Will they jazz it up and put more emphasis on the drama of competition rather than the food and the chefs? Would they have competing chefs being rude to each other, a la Bobby Flay dancing on his cutting board in an infamous match against Masaharu Morimoto? Would Chairman Kaga be back? Do you remember Iron Chef USA? It was so horribly horrendous - but I'd love to see it one more time. The Chairman was William Shatner in all his Shatner-ishness. The Wikipedia entry says that 2 episodes aired. I vaguely remember Todd English I thin. My other favorite cooking related show is MasterChef: The Professionals, a spinoff of MasterChef that airs on the BBC. So while you wait for Part 2, tell me what your favorite cooking show is, and why! Submitted by maki on 2012-12-10 15:02. I loved the original Masterchef on the BBC. The staid understated way they produced the show meant that the food and skill of the amateur was really highlighted. It also made for the perfect sunday afternoon tv viewing, masterchef, antiques roadshow and then maybe a nice childrens drama (if around Christmas), like The Lion, The Witch and The Wardrobe... or The Children of Greene Knowe. I lovelovelove Masterchef: The Professionals! I only just got into it recently, and pretty much marathoned this whole current season over the course of a week on BBC iPlayer. It puts so much emphasis on the dishes and the skills and the cooking, it's great. The only downside is that it makes me hungry all the time, haha. Agreed! Based on the first couple of episodes (that he didn't feature in) I really thought Michel was going to be a scary/annoying Gordon Ramsay-type character, but he's just so wonderful! He's firm and exacting, but his critique is always constructive and he doesn't talk down at anyone. Such a great mentor personality. And yes, Monica... *swoon* I could watch her all day long. I remember staying up until midnight to watch the reruns of the original Iron Chef. Masaharu Morimoto was my favorite, with his intricately cut vegetable garnishes. Chairman Kaga was a favorite as well, he was so passionate about food, as were the judges. The show made me begin to love food, when I learned it was not all grilled chicken and baked potatoes, with a rare pasta dish thrown in (I grew up in an Italian family, but my mom hates pasta). This show is why I began to cook, and push myself to do more complex cooking, as well as pay more attention to how food looks on a plate or in a lunch box. This is great news!! The first time I saw Iron Chef Japan, I was on a family vacation. It must have been a marathon. . .I remember sitting in the hotel room and watching several episodes. I was entranced and in love!! This was many years ago. I managed to find it on a local channel when we got back home. To this day, it is my all-time favorite cooking show! In terms of current cooking shows, I have to go with Chopped. Instead of one secret ingredient there are several per round! Chefs have to be creative in working with the ingredients. I totally agree with you on Iron Chef USA, it was horrible. The followed series was Iron Chef America, which wasn't that much better at first but improved after Michael Symon got on board as one of the chefs. I'm watching the new Japanese Iron Chef from San Diego having DVDs sent to me. I'm sure it'll be on Hulu sooner or later. 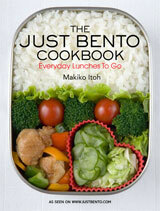 Anyway take care and looking forward in reading more from Just Hungry! My favorite cooking show is Good Eats. I love it for many reasons - Alton Brown is not afraid to be silly and kinda dorky, for one. I also love that he always goes out of his way to explain the history and science behind cooking - even using crazy props (the belching yeast sock puppets and so on). I love knowing the reasons behind why things are done the way they are rather than just "do this cause you have to". Oh, I loved this show! I lived in Japan from 92-95, but didn't see it then. It wasn't until I moved back to MA in 1997 that I was flipping through the channels and heard Japanese and stopped to watch. Ahhhh! My favorite cooking show was The French Chef! Loved watching (and listening!) to Julia :-) On Saturdays in the 1980s, I'd watch that, and the Frugal Gourmet and the Cajun Chef (his accent was cool!) Those were my favs. I also agree that I'm not excited by how ICA treats their ingredients and competition. I still remember Chen-san lovingly cutting butterflies out of potatoes -- magnificent. I just don't feel like the ICA chefs have that kind of passionate regard for their craft. Sakai-san and Chen-san have always blown me away with their skills. I profoundly admire Sakai-san's delicacy and gorgeous plating and sensitive cuisine. I love Chen-san's honesty and simplicity in what he creates. They are true artists, not celebrity chefs. I was excited to hear of a new version. I wonder if TV Japan or a US channel will pick it up. TV Japan is mostly NHK programming, but they do get some Fuji TV stuff from time to time, so I'm hopeful. My favorite show was Taste with David Rosengarten. It's the show that got me really interested in cooking. You can see Good Eats as an extension of Taste, both in format and style, so it's a good runner-up for my top spot of this type of cooking show. Loved the original Iron Chef (dubbed into English)-- I also stayed up as it came on around midnight. It was campy but great kitchen theatre and you had to marvel at the wonderful skills and food they produced in such a short time. The current Iron Chef America is not so lacking in respect as you imagine. Though it features Alton Brown as the announcer, with a light and flippant, though well informed style, the competitors show warmth and respect for each other and the "competition" aspect seems to be more for the camera. These are all well-known and expert chefs and if they feel any loss of face, they don't show it. I think they are all pretty secure in themselves. And they have good judges who show great appreciation for the food. My favourite iron chef was Kat Cora, but Masaharu Morimoto was great too. The Next Iron Chef, though, like all those shows that pit chefs against each other in almost impossible competitions, is heavily competitive because there will be only one winner who will then move onto the show, apparently highly coveted, I think because it puts the person before a very wide audience and gives his or her career a huge boost. My favourite show of recent years was "French Food at Home", a Canadian offering with host Laura Calder. I loved it because of expert photography and styling and the food always made me hungry but looked easy to make-- easy but elegant. I also enjoy Lydia's Italian because the food is authentic, interesting, and delicious and she really knows her stuff without being stuffy. 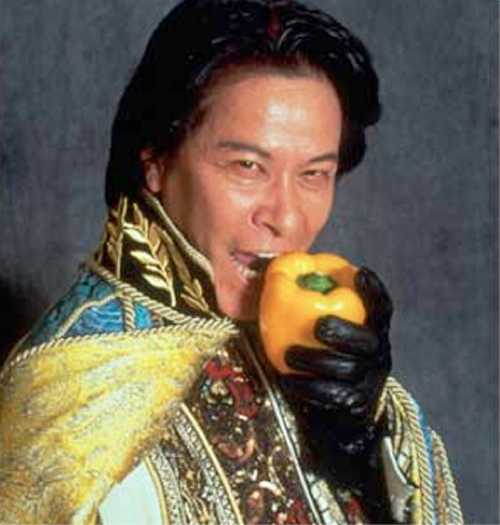 If Iron Chef Japan returns, I fervently hope we get it here in North America. I remember watching the original Iron Chef. I was fascinated with Chef Sakai and how he could peel an apple! The original Iron Chef is the best. Thank you for the information, you made my day! Alas, my favourite German cooking show is being discontinued end of December. It featured great German-speaking chefs (not only from Germany, but also from Austria, Luxemburg, and Switzerland) cooking quite advanced but still manageable dishes. Maki, it's good to see you blogging again. Glad to hear it is back! I wonder what your take will be on the new series. I already saw one review of it. Quite funny, even when sober. I also liked the Frugal Gourmet. I think it also boost business for those Chefs. I know I'd want to go and eat at one of their places. I also enjoyed Around the World in 80 plates. It was a little bit more focused on the drama of the contestants but overall I enjoyed the show and liked how the show presented different countries food by making the contestants cook food from that country. definitely masterchef is my favorite! this last season was so so so inspiring! i've been thinking of joining the masterchef cooking club that cooks the challenges during the season. i think it would be fun and challenging. I, too, loved to watch the Iron Chef. Though I could never reproduce their cooking, it inspired mine. In my opinion, both American versions were horrible, way over the top. The chairman and announcers made it interesting, but kept the focus on the cooking, and always taught me something new. I would be very disappointed if anything is changed, but if it is, I'm sure I'll get over it and enjoy the new show. .in japanese with subtitles , i loved it. did not enjoy it as much when they dub it. still tring to get a copy of "west side story" from japan,kaga sang the part of tony.he also sang the part of "javare" in la miz. Other than that show, my favorites include Good Eats (for the same reasons Lady Saotome stated above), and Martin Chan's China. I used to watch the Iron Chef religiously when it aired on the Food Network. I didn't even care that it was dubbed, it was so amazing. I haven't been able to watch Iron Chef America. I cringed when Food Network first announced its plans to air one. It pains me too much because it doesn't have the soul that the Iron Chef has. Sure, I can understand ICA and I can follow all the cooking and all that frenetic activity, but Alton Brown (bless his Good Eats soul) does not a Hattori Yukio make, and besides, without Michiba Rokusaburo there, I'm just not interested. My fiance and I used to enjoy watching Emeril Live and Emeril Green when they were still on T.V. Emeril Lagasse seemed like he just really loved working with food and made tasty, and later healthy and tasty, dishes. He just seems so genuine compared to the likes of Giada or Rachael Ray. I think he was even on Iron Chef America a couple of times in double battles. It's sad that he's not still on t.v. Everything is competition shows. There are hardly any actual cooking shows on anymore. I always kind of liked watching Iron Chef America even though it was pretty ridiculous (guilty pleasure). It obviously didn't compare to the original but it was interesting to see some of the techniques used by chefs of different backgrounds. It always seemed to me that the Japanese chefs had a strong Japanese slant to their interpretations of Italian, French, etc. Morimoto is undoubtedly the best iron chef. You know anything with him in it is going to be great. I just wish I could taste something cooked by him. Reading through the comments I was also reminded of how great French Food at Home is. Laura is so easygoing. She makes entertaining look effortless. And I've seen her make mistakes that they just left in. She's like my chef crush. Emeril is still on TV, sort of - he's one of the rotating judges on the current season of Top Chef. Maki, so glad you are feeling better. I've really missed your posts! I hope you continue to improve:) I absolutely love the original Iron Chef. I loved watching it as a teen and everyone once in a while ill YouTube some episodes. Morimoto was always a favorite of mine! I really hope some network will pick it up, cause I'd love to watch it! The food network's version of the original iron chef is the still my favorite and the only cooking show that I actually watched repeatedly. I started watching it in high school and for a final group project in french class we did our own mini version of the show in french~ When I watched the Iron Chef America version, one of the big differences I noted was in the plating. Ooo, I'll never forget the first time we stumbled on the original Iron Chef! My husband and I just sat there STARING at it, like this: ?o_O? Only took one episode to become fans. One of the most brilliant ideas in the history of EVER. And very inspiring - to treat a single ingredient like royalty, and craft courses around it, trying to bring out subtle and outrageous flavors from it. I always particularly enjoyed the times when they had something desperately ordinary as the secret ingredient. To see how someone who views flavors as some view art or music treats a bell pepper when it is Cinderella going to the ball - what a wonderful thing! KTSF in San Francisco used to air subtitled Iron Chef episodes before the Food Network obtained the rights. It was during a programming block from Fuji TV that would air on Saturday nights. They would air Japanese dramas, Megaten, and other programming. Gosh I'm feeling so nostalgic right now but I really loved watching those episodes. At one time they paired it with a drama called Oishii Kankei and I fell in love with Japanese cuisine. I can still recall Nakamura winning the egg battle and almost being in tears watching it.